My husband took this photo this week just a mile or so from our house. As you can see, we’re still getting snow around here. This week I’d like to introduce you to one of our new bloggers, Alexa Verde. Her first post with Inspy Romance will be tomorrow. Alexa writes both Christian contemporary romance and romantic suspense from her home in Texas. She’s traveled the world and lived in both hemispheres, and she loves to share characters with culturally diverse backgrounds. I know you’ll enjoy Alexa’s posts! 3 MORE DAYS TO ENTER THE BIRTHDAY BASH CONTEST!! The 2017 Birthday Bash closes at midnight Mountain time on March 14. We’ve got lots of terrific prizes, including an INTERNATIONAL PAPERBACK giveaway for the first time. Comment often before the contest closes for your chance to win. Click here for prize details. Also, don’t forget… every comment you make qualifies you to win one of the monthly Amazon card giveaways! On Monday : Narelle Atkins talked about The Disappearance of Our Local Christian Bookstores. Tuesday: Annalisa Daughety issued an invitation: Let’s Talk Book Covers! Wednesday: Carol Moncado took us Behind the Scenes with Glimpsing Hope Cover Creation. Thursday: Marion Ueckermann asked What Kind of Cover Girl Are You? Friday: Lee Tobin McClain answered the question Can I Be in Your Book – Well Kinda! Hi Valerie, wow, looks cold. I have never seen a moose before- it does not look keen to walk on the cold snow!! We have had beautiful, warm days, but the evenings are getting cooler. We spent the day at the Lost Trades Fair- how awesome to watch fletchers, blacksmiths, chandlers, cobblers, weavers, spinners and more at work. Had to laugh, Wemble. Moose are creatures of the North – Canada, Alaska, and northern Europe/Asia – all places with snow and cold weather. They wouldn’t last well in the heat of Australia! God made species suited to each type of environment. Would love to go to a fair like that! That does sound like a fun fair to go to! Welcome, Alexa! I never realized moose have such long legs, Val. After a week with temperatures in the 70’s, it’s snowing here this morning…yuck! Moose are very tall, very big. We once came around a corner on a dark, snowy night, and nearly hit one. We were in a BIG pickup truck, and the body filled the windshield. If we’d knocked its spindly legs out, the thousand-pound-plus body would have come straight through that windshield. WHEW! Yay for snow!!! Although I am ready for Mud Season around here. Trust me, we will have a lot of it as this melts. Hi Valerie! Looking forward to meeting Alexa tomorrow. Why did the moose cross the road? To have his picture taken of course. So amazing to think those skinny legs can support the weight of its body. Always a delight of God’s wonderful creation to see wildlife in the city. Living a block from a ravine we often have deer in our yard. Our Sheltie isn’t to keen on wild critters invading her space. After a week of temperatures in the 50s, now it is back in the 20s. Lake Michigan has beautiful waves. Blessed Sunday and Happy Writing! Lake Michigan is beautiful. Haven’t been out there in a long time. We are getting our first real snowstorm Monday night. Since we’re moving and it has been unseasonably warm i packed my snow boots and sent them with my sons to take to storage two weeks ago,several states away. I love to watch it snow though. The moose wanted to get to the other side! Or to be in a blog post! Uh oh! Keep your feet warm and dry! 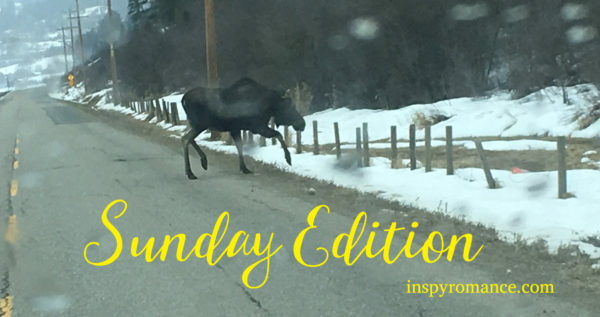 Yes, the moose MUST have seen a chance to be featured on Inspy Romance! I don’t know why the noise crossed the road. I don’t envy you the snow. We may have crazy weather in Georgia, but we don’t do snow well. Have a wonderful Sunday. Looking forward to Alexa’s first post tomorrow. She is a phenomenal writer!!! I love snow… but not quite so much of it this late in the season! I’ve had to keep reminding myself that it’s still technically winter for another week or two. This year it is acting like it. I’m glad to see Alexa has some fans waiting for her! The moose crossed the road to get to that patch of brown grass, lol. Welcome Alexa, and Happy Birthday to the blog! Valerie, It’s fun to see the moose. I have a friend in Alaska and she has them all the time in her front yard. That one is a big one. Are you getting as tired as we are of the winter. Today we had a bit of sunshine. Hopefully we’ll have more soon! We spend a lot of time in the mountains around here, camping and hiking, and we don’t see moose all that often, not even every year, and rarely on the farmland where this one was coming from. So, while they’re not unusual here, they’re not nearly as common as deer or elk. And yep, ready for spring! aka: Mud Season. I look forward to reading Alexa’s blog tomorrow. I am not sure I’ve read one of her books. I think you’ll find her approach fresh and unique! Love the moose picture. We often have deer in our yard, especially in the winter. One July, I looked outside to see a buck dodging the sprinklers in our back yard. It was fun to watch! Oh wow, did you get a photo? That would be something to see! No, unfortunately. It didn’t stick around long enough for me to grab my camera! A couple of months ago there was a smaller deer standing on my back porch by my French doors. They’re pretty nervy sometimes! LOL Last spring I found 6 pheasant eggs under my lavendar bush. I left them there for a while to see if the mom would come back, but she never did. A couple of years ago we had a rooster pheasant that would come around at least once a day and crow it’s heart out. I missed it when it moved on. I love seeing nature, too! Joelle, thank you so much for your wonderful words! You made my day! Valerie, thank you very much for introducing me! Heartfelt thanks to everybody for warm welcome! I’m so excited to join Inspy Romance. Uh oh, don’t see my comment made yesterday! Oh well, wanted to say I am looking forward to meeting Alexa!! Thank you, Jackie Smith! I’m happy to meet you! LOL, there’s nothing but snow on that side of the road and up the mountain! Do you see moose near your house very often? I live near a busy road in a suburban area with a narrow strip of trees behind my house and I am visited by different kinds of wildlife but thankfully, the largest animals I’ve ever had in my yard were deer. Not really often, no. Deer and elk are much more common. We do see a moose every year or two, but usually up in the mountains, not on the flat farmland. Did you mean March 14 for the giveaway to end? It said February lol. Can’t wait to meet Alexa! I’m behind on the posts. The moose crossed the road to enjoy all the snow that he’s having that I haven’t had any of. Even what they called for today didn’t show up. This has been such a disappointing winter. Love the moose and snow picture!